Q. Are Mediums and Psychics the same? A.No they are not. Mediums are also Psychics but Psychics are not Mediums. Mediums and Psychics work on two different levels. The psychic vibrations are closer to the Earth Plane and it may surprise you to know that each and everyone of you have the ability to develop this sense. In days gone by as we evolved as a species, this 6th sense (the psychic for that's all it is) was part of our survival mechanism. Designed to keep us safe and out of danger i.e. that "gut feeling" that something was wrong or that we smelt danger. However as we became more civilized we began to depend less on our instinct and our psychic sense. Animals however still have this ability and if you watch your cat or dog you will see them tap into this sense. Mediumship though cannot be developed this is a gift bestowed on the Medium and many a Medium will tell you, "Is it a gift or is it a curse?" It can be both. 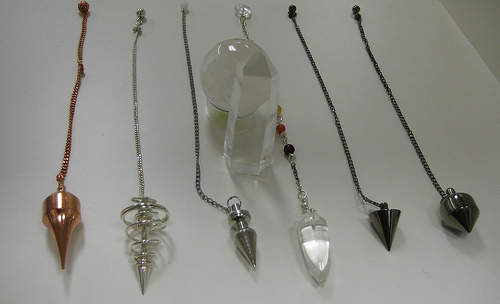 Mediums work on a higher vibration that that of Psychics and equally they can also work on a psychic level. Mediums have the ability to pick up and interpret the high vibrations from Spirit, just like a radio. Q. You mention different levels of vibration what is the difference? 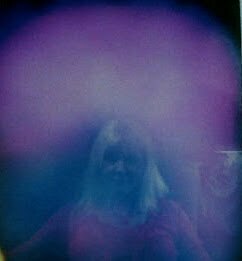 It is on the Astral planes we visit when we dream, also on the Astral planes you will find souls who generally because of some trauma are unable to move on and pass over to the realms of Spirit, they appear to be stuck in limbo. 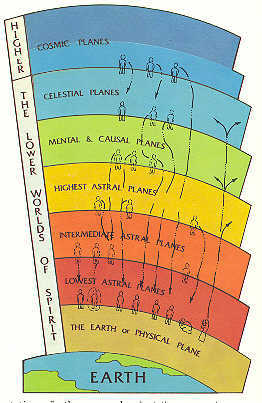 The Astral planes is where you will find lower elementals, these are nature spirits, such as elves, nymphs etc and all those negative ones who like to cause mischief. It is also common when we start to open up psychically to see those elementals. For they know you have this ability and to them its akin to having a beacon flashing above your head and they will home in and cause mischief. This may take the form of a dream or what's common you will have a sensation of waking up and feel you are being attacked by a dark figure. They cannot harm you in any shape or form nor can they possess you, a myth brought about by the catholic church. No one can take control of your physical body or your soul, only you can do this. Your soul is fixed in your physical body until the point of death and then passes over to the spirit realms. Yes these experiences may be frightening but that's all they can do frighten but they cannot harm or hurt you in any way. When you develop psychically a bit more all you need do is tell them to get lost and they will go. A. 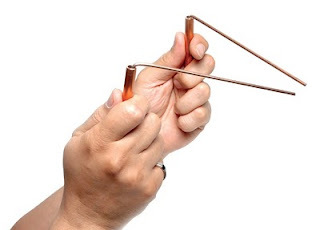 Indeed it is possible and one of the best ways is by Dowsing? The short answer is that no-one really knows – it just does!. The scientific world, geologists and archaeologists and so on appear to put their heads in the sand because here is something that cannot be Proved nor can it be Disproved scientifically. However it is surprising how many water, mining, oil companies and so on use dowsers in exploration work – it is never admitted because it may take away the credibility of the large concern – increasingly police forces etc. will use the services of a dowser. All that can be said is that it is an in-built ability within man from the beginning of time, it helped him to find his food and water and his minerals thus to survive and protect us from danger. In addition it helped him to communicate with other members of his tribe at a distance and there are still in this world so-called primitive tribes who have these natural abilities to this day. Gradually over the centuries our so called sophistication and civilisation etc. have stifled these natural abilities, plus, of course, condemnation by the church particularly in the period of about 1610 until the late 1700’s and even today when it was and is, by some, considered the work of the devil. I firmly believe that it is some primeval and natural instinct that lies deep within us all, the Mind which has the ability to receive communication from the Universal Mind that knows and controls everything that there has ever been, that there is and ever will be – God. I firmly believe that it is a God given gift – to everyone who is prepared to develop and use it – to be used for the benefit of our fellow man and the world in which we live. We all have an inherent ability, call it intuition, sixth sense and this can be developed by practise. Oil – Gas: The location of oil deposits under the land or the sea and the depth below the surface and an estimate of the quantity and the quality, also the porosity of the rock strata in which it lays. Archaeology: The location of unknown sites where nothing shows on the surface of the ground. Building Sites: Examination for all purposes, the water runs underneath them, rock state, soil state, rock faults, old wells, cavities, cellars, drains, sewers, cables and pipes and so on – especially if it is intended to build on that site. Missing people: This is one of the most difficult tasks owing to the difficulty of identification and should be undertaken with care and careful preparation – bear in mind that some people deliberately ‘disappear’ for their own personal reasons and have no wish to be found. What do I need to be able to dowse? Angle rods: The easiest and simplest of all tools to use. 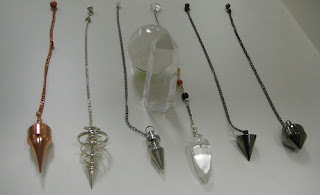 They are just lengths of wire bent at right angles and can be made quite easily from old metal coat-hangers, welding rods, thin brass rod, thick wire., for example; take a pair of wire coat hangers and cut them so that the top is about 9 to 12 inches long and from the angle towards the hook for hanging, about 4 to 5 inches long, then, having cut it, bend the angle to 90 degrees. The short length is held in the hand as the handle, though if its windy and you are using them to locate something outside its best to use something a bit heavier as in brass etc. 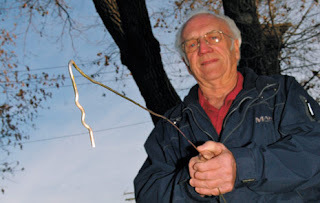 Wands: These are just springy lengths of thin branch about 36 inches long and are ideal for dowsing up a wall, for example following the path of an old chimney – these tend to meander up the walls of old houses. A modern materials are taking over and the usual wand is a 36 inch length of fairly thin plastic. When you dowse focus on the object you are trying to locate and don't tense up keep relaxed so as you don't interfere consciously with the tool you are using. When you are trying to locate something you have lost in your home make a list of questions that can be answered by yes or no. and go through the list methodically e.g. is my lost ring in the bedroom, is it in the living room until you narrow it down, when you have double checked this answer break it down further divide the room into sections and again ask the questions is it in this quarter of the room until you have narrowed it to enable a through search of the area. Like all skills it needs practise. Q. Why cant psychics tell me This weeks lottery numbers and oh,,,,will i be marrying an 18 year old blonde stunna soon ??? A.Well Lol this is because of Karma and the laws of the Universe.Well before we incarnate as Spirit in a human body, we decide on what experiences and challenges that will benefit our spiritual growth. However we are given the choice (free will) as to whether we go through with the experience or challenge. In effect we are allowed to change or mind. Its not possible to predict the future accurately because of free will Remember we are 'Spirit' in a human body and your spirit does retain a memory but it is deep in our subconscious. This memory is retained deeply for a reason to help us fulfill our experiences and challenges we ourselves chose. However it is also at this deep level so we are not so aware. If you knew what lay before you would you go through with it? Probably not but we still retain this memory deeply and this reflects in our Aura. So to answer your question you haven't chosen this route in life. God and the Universe will always see we are given what we need, it might not be what we want, but it will be what is needed to help us grow closer to God. A. Yes it can. Becoming interested in Tarot or watching paranormal films can awaken a latent psychic ability yes, its always been there. But you have to ask yourself why are you interested in Tarot or the paranormal? mostly likely because you have chosen this route in life for yourself and you are merely fulfilling your destiny. Everyone has an inherent psychic ability Now everybody is capable of developing their psychic ability, this is not the same as mediumship, where you can communicate with spirit, this psychic ability is inherent to all of us and was designed as a protective mechanism to keep us safe. Animals still use theirs, we have just got out of the habit and in this day and age we do not use it for survival. However some are more psychically aware than others so are able to sense entities on the Astral Planes. Lower Elementals. The universe has its own vibration, Earth having the lowest in spiritual terms. After Earth comes the Astral realm, it is on this realm that we travel when we dream, its not unusual to see friends etc, in dream state, after all they will be traveling this realm too at night lol. It is on this realm where lower Elementals reside, i.e. wood nymphs, nature spirits, elves and fairies amongst others, and as often as in the case spirit who are trapped unable to move on also reside in this vibration. this is the same vibration used in psychic work. There are several spiritual realms each having a different vibration, with the most Celestial where the realms of the Angels are. I might add it is the Astral Plane that Psychics use as it is a lower vibration that the ones used by Medium's when they communicate with loved ones in spirit. Like everything in the Universe there are two sides to a coin, Yin and Yang, good and evil, dark and light, so as you develop there will come a stage when you will be shown the dark side. Remember one of the fundamental laws of the Universe "The law of attraction" Like attracts like, so if you always walk in the light, you wont attract the dark. Furthermore it is an ability that can't be forced it will develop at the right rate for you. You cannot train however to be a Medium you are born that way, and it is a gift bestowed upon you, though you can fine tune your Mediumship abilities.